Spring is one of the busiest seasons in the equine industry. From preparing for a competitive show season to conditioning horses for field work, we ask our equine athletes to perform with stamina and endurance every year. The Crystal Advantage® equine product line has been created for horses who need to perform at an optimum level despite the stress of traveling, competing or dealing with weather changes and heavy workloads. Getting the most out of your horse requires good nutrition. A high quality mineral source is a key component to any equine nutrition program. Working horses are subject to various stressors and can benefit greatly from a sound foundation nutrition program. Crystal Creek® has formulated an advanced line of equine nutrition supplements marketed under the product line Crystal Advantage®. The Crystal Advantage® product line is broken down into two categories: 1) Foundation Nutrition Products and 2) Strategic Use Products. (See Figure 1). 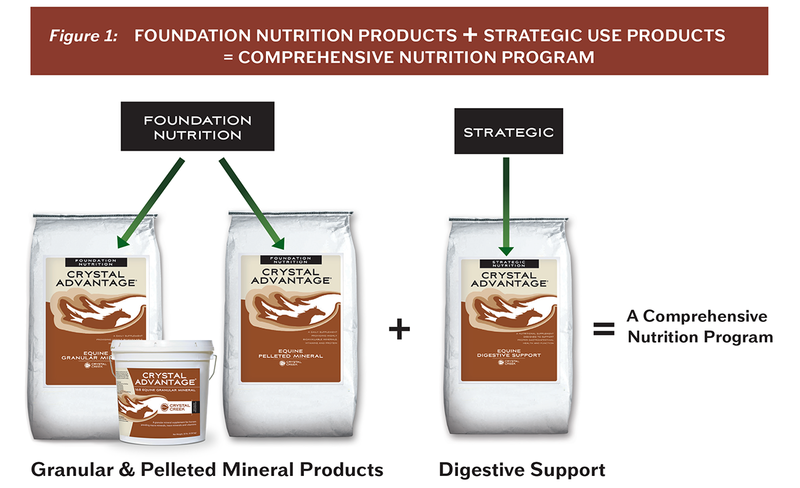 The term “Foundation Nutrition” is described by Crystal Creek® as high quality, daily nutrition that is meant to be used on a long term basis for establishing fundamentally sound, overall health and function… simply put, these products are the foundation to a sound nutrition program. Crystal Advantage® minerals are an example of foundation nutrition supplements and are available in pelleted and granular forms. Crystal Creek® recommends granular or pelleted minerals over mineral licks/blocks to ensure proper intake. Crystal Creek® utilizes a high quality pelleted protein in the Crystal Advantage® pelleted mineral. Pelleting reduces the risk of separation of key nutrients in the grain ration resulting in more consistent and accurate delivery of nutrition. A cleaned macro-mineral source to reduce levels of heavy metal contaminants (iron, aluminum, lead and fluoride). Polysaccharide complex trace minerals which are highly bioavailable for improved absorption and utilization. Strong vitamin and Biotin levels to support skin integrity, hoof health, immune system function and muscle recovery. A 100% Selenium Yeast source which is over 90% bioavailable. Studies on the ingredients used in the Crystal Advantage® product line have shown improvement in endurance and post-exercise muscle recovery. 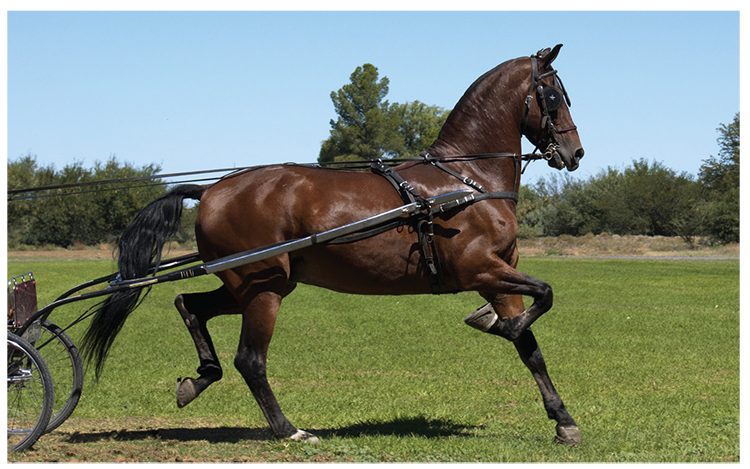 Endurance is a key factor in conditioning horses to peak performance. In the equine industry, muscle recovery is important to prevent tying up and straining/bowing tendons. Offering grain and hay rations with less protein and minerals than what is required can cause horses to metabolize needed minerals from their bones, reducing their musculoskeletal function and performance. The Foundation Nutrition program promotes a strong immune system, better hoof health and a shiny hair coat. It is vital to boost the immune system when traveling circuit or introducing horses to new or unfamiliar environments. In addition to helping with performance issues, the Crystal Advantage® product line offers flexibility with feeding. It is easy to top dress or mix Crystal Advantage® mineral into your balanced grain ration. 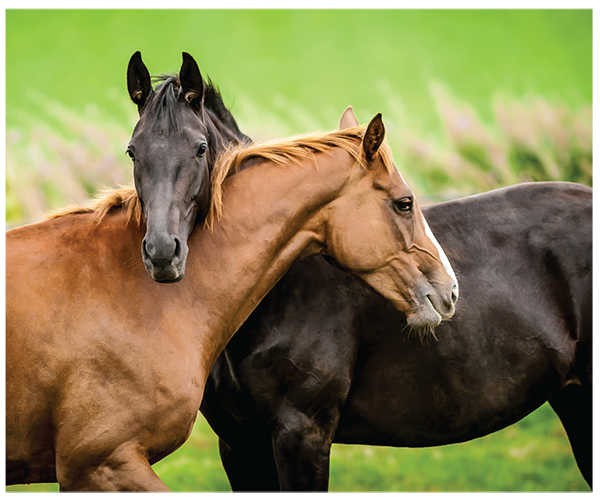 The Crystal Creek® Crystal Advantage® product line has a broad range of applications from working, performance and pleasure, to growing foals and breeding stock. Providing your horses with a balanced daily nutrition program reduces the need for additional nutrition packs; thereby lowering your feed cost. Strategic products are used on a short term basis for targeting specific problems or conditions. Stress management is essential for consistency in equine performance. Crystal Creek® recognizes this need and has developed a strategic support product to be used as a tool during times of stress. Crystal Advantage® Digestive Support is designed to work in addition to your horse’s daily nutrition program. Feed Crystal Advantage® Digestive Support a week before intense workload/stress, during intense workload/stress and for one to two weeks after intense workload/stress to optimize your horse’s performance. Stimulate the immune system along the gastrointestinal tract. Decrease inflammation by selective COX-2 inhibition. Promote nutrient absorption in the lower gastrointestinal tract. Stop/reverse gastric ulcer formation in laboratory models. Crystal Advantage® Digestive Support contains a comprehensive profile of high molecular weight polysaccharides that have been shown to support immune function, intestinal absorption, digestive health and help counter the effects of inflammation. 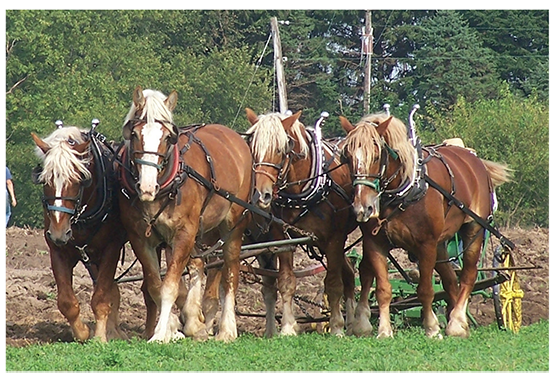 Traveling, transporting or working horses presents a challenge to their immune system. Workloads heavier than expected and repetitive movements may cause lameness requiring stall rest which may delay work progress. Even the intense fly pressure of summer can negatively affect a horse’s immune function. Balancing quality grain and hay rations with the Crystal Creek® Crystal Advantage® line of high quality minerals and using Crystal Advantage® Digestive Support during challenging times is key to supporting the horse. Crystal Advantage® minerals and Digestive Support are two key products that will help maximize your horse’s potential. For more information on our equine nutrition services or to view additional Crystal Advantage® equine products including fly repellent and equine salve, visit us at www.crystalcreeknatural.com or call 1-888-376-6777 to speak with one of our knowledgeable nutritionists or livestock specialists.